Jemima Bobo was born on 24 April 1818 at Athens, Athens, Ohio, USA.1 She married Henry Johnson on 10 January 1839 at Athens, Athens, Ohio, USA; Named after Athens, Greece; home of Ohio University. Jemima Bobo Book: The Bobo Family History , Draft Manuscript, Revised June 1990by Charles Henry Bobo, page 3-7 states the marriage record is fromAthens County, Ohio, Vol.1/2, page 147. The marriage was performed byJonathan Brine, the bride's brother-in-law. Her married name was Johnson. She died between 1897 and 1904. She was buried at McArthur, Vinton, Ohio, USA. John F. Bobo was born in 1852 at Ohio, USA. He married Mary Louisa Tedrow on 25 February 1877 at Vinton, Ohio, USA. Joshua C. Bobo was born in 1798 at Virginia, USA. He married Sally Reynolds on 4 March 1819 at Athens, Athens, Ohio, USA; Named after Athens, Greece; home of Ohio University. Joshua C. Bobo married Mary Black, daughter of Daniel Black and Mary Bobo, on 22 March 1832 at Athens, Athens, Ohio, USA.1 Joshua C. Bobo Copy of Marriage Record: Bobo & Black The State of Ohio, Athens Co. Ihereby certify that on the 22 day of March I joined together in theholy state of matrimony Mr. Joshua Bobo & Mis Polly Black of lawfulage. Given under my hand and seal this 3rd day of May 1832. Abram C.Martin, Justice of the Peace. Date of License 1832 March 20. Vol. 1/2,Page 89. US Census 1840, Athens County, Alexander Twp., Ohio, page348. Males (10-15) - 1; (20-30) - 1; (40-50) - 1; females (under 5) -1; (10-15) - 1; (15-20) - 1; (30-40) - 1. U.S. Census 1850 VintonCounty, Ohio, Township_______, Page 243. Listed are Joshua Bobo, 52,a farmer and his wife, Polly, 39. Both were born in Virginia. Alsolisted were six children. I have to repeat this Census. Notes ofRoberta McKenzie indicate that the children of Joshua Bobo and SallyReynolds listed are the possible issue. He died in June 1859 at Vinton, Ohio, USA. 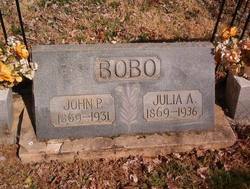 Julia Ann Bobo was born between 1806 and 1807. She married Robert Hudson on 20 January 1825 at Athens, Athens, Ohio, USA; Named after Athens, Greece; home of Ohio University. Julia Ann Bobo Notes of Roberta McKenzie: Census: 1840 Delaware County, Indiana;1850 Cass Co. Indiana, Washington Township p. 4596. Julia 42, Jarrad18, Samantha16,Elizan 12, Joseph 9, Alice 6. Check for a land grantRobert received in Delaware County, Indiana. Katherine Margaret Bobo was born in 1852 at Ohio, USA. She married James A. Nichols on 18 November 1869 at Vinton, Ohio, USA. Her married name was Nichols. Katherine Margaret Bobo died in 1919. Leonard Bobo was born on 16 April 1868. Letta Bobo was born in 1827. Louisa Bobo was born in 1843 at Ohio, USA. She married Jacob Tedrow on 30 December 1860 at Vinton, Ohio, USA. Her married name was Tedrow. Louvina M. Bobo was born in 1858. She According to Lena Liggett, daughter of Fanny Bobo Robertson, andgrandaughter of Susan Wade Bobo, Lovina was a beautiful spirited andred haired girl. She liked to go dancing, and for the sake of beautywould not dress warmly enough. She contracted tuberculosis. Afterbecoming ill, she wished to be baptized and the minister broke the iceon the creek and baptized her. James Robertson who later married hersister, Fanny, was first in love with Louvina. Louvinia Bobo was born on 18 June 1867. She Louvinia was unmarried. She died in 1921. She was buried at Meigs, Ohio, USA. Lucinda Bobo was born in 1849 at Ohio, USA. Lucretia Bobo was born in 1809 at Athens, Athens, Ohio, USA; Named after Athens, Greece; home of Ohio University. She married George Luckey on 9 January 1827 at Athens, Athens, Ohio, USA; Named after Athens, Greece; home of Ohio University. Lucretia Bobo Notes of Roberta Mckenzie: Census: 1840 Decatur County, Indiana; 1850Harrison County, Indiana, page 371. Her married name was Luckey. She died on 11 July 1900. Lucretia Bobo was born on 5 September 1845 at Meigs, Ohio, USA. She married Noah Castor in 1866. Her married name was Castor. Lucretia Bobo died on 31 August 1919 at Kansas, USA, at age 73. Lucretia Bobo was born in 1827. She married Ira Hooper on 9 January 1845. Her married name was Hooper. Lucy Mariah Bobo was born on 10 November 1844. He married Michael Hayhurst on 15 April 1858 at Missouri, USA. Lydia Bobo was born in 1851 at Ohio, USA. Margaret Bobo was born on 17 September 1851 at Meigs, Ohio, USA. She married John Throckmorton on 21 May 1870. Her married name was Throckmorton. Margaret Bobo died on 5 May 1928 at age 76. Margaret Emma Bobo was born on 6 September 1892 at Madison, Alabama, USA.1 She died on 31 August 1907 at age 14. Maria Bobo was born on 27 March 1849.1 She married Henry Cottrill in June 1865. Her married name was Cottrill. Maria Bobo died in 1880 at Missouri, USA. Mariah Bobo was born on 6 April 1817. She married Ephriam Hewitt on 8 October 1835 at Athens, Athens, Ohio, USA.1 Her married name was Hewitt. Mariah Bobo died on 6 May 1898 at Ohio, USA, at age 81. Marquis L. Bobo was born in 1821 at Ohio, USA. He US Census 1860 Vinton County, Ohio, Madison Twp. Kim found this - Ineed to repeat.